CFR’s map is “made possible by the Bill & Melinda Gates Foundation,” and is part of The Global Health Program at the Council on Foreign Relations, which it claims “provides independent, evidence-based analysis and recommendations to help policymakers, business leaders, journalists, and the general public meet the health challenges of a globalized world.” The problem, however, with this map is that is not based on peer-reviewed biomedical evidence as one would expect, but largely anecdotal evidence aggregated from unconfirmed and often unverifiable news stories. With not a shred of evidence, reporters like Michael Hiltzik from the LA Times opine that the prevalence of measles in Europe — especially Britain — and the U.S are an “artifact of the anti-vaccination movement, which has associated the vaccine with autism.” Really? Why no mention of the extensive evidence within the published literature of measles vaccine failure in the US since 1995 in immunization compliant populations, revealing that measles epidemics are often due to a failing vaccine and not the failure to vaccine? If the CFR’s map is ‘evidence-based,’ why no references to the primary literature? Reasons for the increase are multi-pronged, but may be due in part to changes to the pertussis vaccine, according to the study. “Animals that received an acellular pertussis vaccine had the bacteria in their airways for up to six weeks and were able to spread the infection to unvaccinated animals. In contrast, animals that received whole-cell vaccine cleared the bacteria within three weeks,” according to a news release from Jennifer Rodriguez, a spokeswoman for the FDA. Clearly, the CFR’s map cannot be taken seriously, and is simply a higher order expression of at best subpar health reporting, at worst baseless propaganda, demagogically projected into the media to hapless consumers whose ability to think critically and question authority is virtually non-existent. By framing advocates of non-vaccination as rabidly irrational ‘anti-vaxxers’ and blaming them for what are often non-vaccine preventable diseases — having far more to do with environmental factors such as access to clean water and basic nutrition — the CFR (and the Bill & Melinda Gates foundation who shares responsibility in creating this disturbingly inane and non-credible piece of propaganda) is joining a growing global movement, recently evidenced by UNICEF’s attack on independent health journalism related to vaccines, aimed at eliminating vaccine choice, despite increasing awareness of their true dangers and lack of effectiveness. 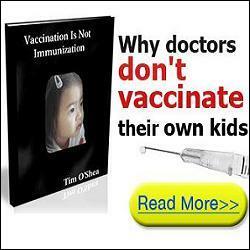 The result of this shoddy work, however, is to further lionize a growing global movement to reject the alarmingly rapid expansion of vaccine schedules in favor of a more natural, precautionary approach to disease prevention. Be the first to comment on "Gates Foundation/CFR Propaganda Against ‘Anti-Vaccine’ Movement Backfires"